As a published author of a wildly successful book called, There’s Not an App for That, Cary Pfeffer had us laughing and engaged as he shared his passion for communication. With a keen eye for connection, he encouraged us to take time to speak authentically and succinctly about our desires, futures and knowledge. As we talk with others it is best to know your audience. What do they care about? Who do they aspire to become? How can you authentically help them get there? Do a bit of research to know who you are speaking with, especially in an interview situation. The secret sauce in the networking and interviewing process is to listen. When you listen well you will be better able to answer the specific questions they are asking without oversharing! Many times in a networking environment or an interview process we believe that we have to be the quintessential ideal of someone. But that isn’t required, in fact is detrimental and fake! He encouraged all of us to be an authentic representation of who you are. You are the best at being you! He couldn’t have emphasized this point enough! Do not overshare! When people ask the time they don’t want to know how your watch was made. They want to know the time. Editing your words to hit the important points is essential to creating engaging dialog. Despite your deep passion and knowledge for a certain subject, it is best to not firehose them with all your information in one sitting. When we are networking and interviewing, there is no reason to go into a long, involved drama or detailed jargon that overwhelms the interviewer. When you are looking for a new job, you want to talk about your skill set and how you can contribute to their cause and then stop talking. Listen. And when they respond with seeking more information, answer their questions in a natural, authentic and succinct way. In one sentence, write what you are all about. The goal is to elicit a thought in someone’s head. How does this connect to the listener? It is as much about your words as how you say it. Are you speaking from the heart or is it some memorized statement that sounds tired and flat? Try to communicate your direction and confidence for life. If you can’t communicate your vision for your life, why would anyone else want to buy in? Fact: The written word is interpreted more negatively than it is intended. Because written language lacks body language and tone, consider the importance of the words you use. Demonstrate why what you are saying should matter to the listener and get straight to the point! If possible keep your words no longer than the space of an email window. Don’t wait until the third paragraph to say what you need. People will stop reading and never go back to it. When crafting emails make sure you spend time on the subject line and greeting. If you type the first thing you think of into the subject line it’s probably the first thing everyone else thought of. The first words should get straight to the punch with why this is worth listening to. Instead of a long winded exhale while verbally noticing that, “well I guess that’s our last slide”, perhaps end the meeting with a human story of why this meeting was of real importance. Don’t underestimate the Question and Answer time. Many people make their decisions during the Q and A so spend time predicting what questions they might have and come prepared. Remember that the point of communication is connection and without listening to others, it’s hard to find a connection. Cary stated many times throughout the talk that the most overlooked skill in communication is listening. He ended with a reading about smiles from his book. 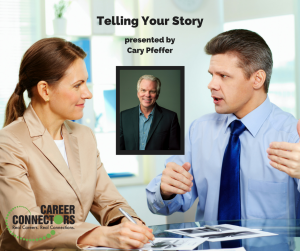 It was a delight to listen to Cary Pfeffer share his experience and wisdom and hear his encouragement as we begin to wordsmith our own stories in hopes to find connections with others. If you would like to sign up for Cary’s monthly emails, purchase his book, or find his email address, go to his website. Alorica’s mottos is: Do what you love, love what you do! Their office is located on Gilbert Road and Main Street in Mesa. A business that serves other businesses clients, Alorica could be the right placement for you if you are passionate about customer relations and want a flexible schedule. Their current opening is in Inside Sales and they take promotions and growth opportunities very seriously. You also can obtain Medical, Dental and Vision insurance after 30 days on the job. There is also the option for tuition reimbursement and 401k available after 90 days. More information here. Robert Half is a specialized staffing firm that can staff anyone in the office. For a complete job listing, go to their website. They do great work with veterans and are looking for agency owners. Click here for further details. There is an upcoming military career event. Attendance is FREE for all job seekers! Create your profile to be pre-matched with hiring companies for onsite interviews March 7! More information including participating companies can be found here. On March 15th Andy Gray will be speaking about “How to Get Your Message Across in 60 Seconds or Less” in Scottsdale. Join us!